Ever since I first saw the trailers for this movie I have refused to call it by its actual name of REAL STEEL. Far as I was concerned this was “Rock ‘Em Sock ‘Em Robots: The Movie” and now that I’ve actually seen it, I think it deserves that title even more. Because that’s just what it is; robots rockin’ and sockin’. Wrapped around the epic ‘bot battles is a heartwarming story of a father and son reconnecting and without the story, the movie wouldn’t nowhere be near as much fun as it is. It’s twenty minutes into the future and human boxing has been replaced by robot boxing. Charlie Kenton (Hugh Jackman) stays in the game thanks to the underground illegal robot boxing arenas. He buys robots on the black market. Robots who usually lose. On the run from men who owes a lot of money to, Charlie is informed that his ex-girlfriend has died, leaving behind her 11 year old son, Max (Dakota Goyo). Charlie has absolutely no interest in being a father so he makes a deal with Uncle Marvin (James Rebhorn). Marvin wants to go away to Italy with Aunt Debra (Hope Davis) for a final fling as a couple before settling down to raise Max. For $100,000 Charlie agrees to sign away all legal claim to Max and take care of the boy for three months. Neither Charlie or Max is happy about the arraignment and caught in the middle of their mutual antagonism is Charlie’s long suffering girlfriend Bailey (Evangeline Lilly). She’s had with fixing the busted up robots Charlie keeps bringing home. And the final straw is when Charlie badly mishandles the controls of a Japanese fighting robot named Noisy Boy. Noisy Boy gets trashed in a fight, leaving them all broke as Charlie spent his $50,000 advance buying the robot. But things change when Charlie and Max find an entire working robot in a junkyard while foraging for replacement parts to repair Noisy Boy. The found robot, named Atom is a sparring robot. He can take a lot of punishment but he can’t dish it out. Taking parts for Noisy Boy and another robot, Charlie and Max upgrade Atom and take him on the road where Atom proceeds to take the robot boxing world by surprise when he wins match after match. In the process attracting the attention of genius robot designer Mashido (Karl Yune) and Farra Lemcova, the brains and money behind Zeus, undisputed champion of The World Robot Boxing League. Atom is becoming too popular too fast and so a unique challenge is proposed. One that may destroy the bond that has been forged between not only between father and son but between boy and robot as well. Don’t let that last line throw you. 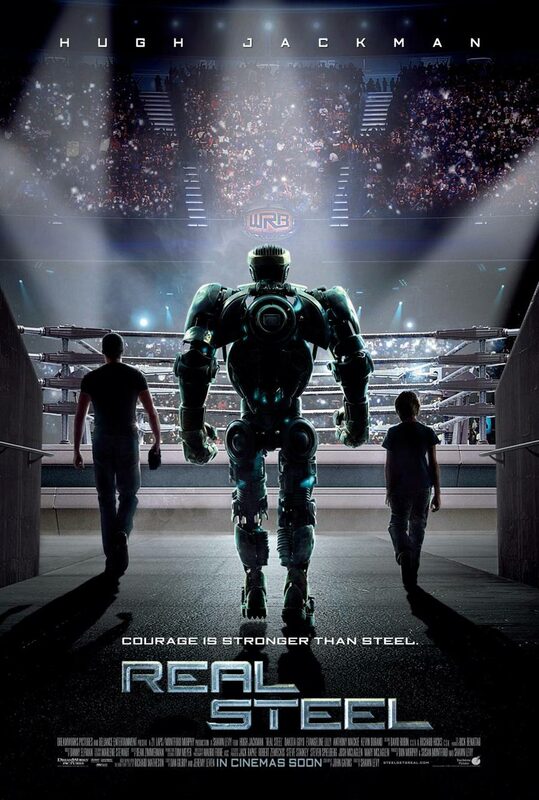 You don’t have to have seen a lot of boxing movies to tell how REAL STEEL is going to end up. Or think this is going to be a heavy emotional trip. Every single beat REAL STEEL hits goes all the way back to 1931’s “The Champ”. 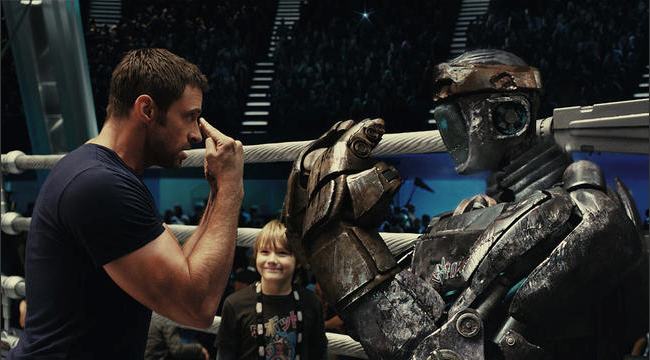 That’s not to say that REAL STEEL doesn’t have fun with boxing movies tropes. I especially enjoyed the choreography of the robot fighters as well as their distinctive visuals. In the “Transformers” movies it’s impossible for me to tell the robots apart or understand what’s going on in the fight scenes. Not so in REAL STEEL. The great Sugar Ray Leonard was the boxing consultant for the movie and it shows. Even though these are CGI/animatronic seven foot tall, thousand pound robots, they move with the fluid grace and realism of human boxers. It’s exhilarating to watch. So should you see REAL STEEL? Absolutely. It’s a fun movie and Hugh Jackman is always good in whatever movie he’s in (yes, even “Australia”) while Evangeline Lilly surprised me. I only know her from “Lost” but judging from this movie, she’s got a nice career ahead of her. Dakota Goyo plays one of those hyper-intelligent movie kids that usually gets on my nerves. You know the type; they’re not really kids at all but small adults. However, in this movie it kinda works as Max is a kid who has been forced by circumstances to grow up before his time while Charlie has simply grown older. Not necessarily ‘up’. There are a couple of amusing scenes where Charlie and Max appear to have switched roles as child and adult. I usually don’t hope for sequels but I am hoping for a REAL STEEL sequel. And maybe they’ll go ahead and call it REAL STEEL II: ROCK ‘EM SOCK ‘EM ROBOTS. That would be nice.